He may never fully repair the damage to his reputation, but Tiger Woods' golf legacy is still intact, and Tiger Woods cards continue to be among the most popular hobby choices from the links. The 2019 Masters gave Tiger Woods 15 major championship victories, and 81 PGA wins overall, which puts him just one behind Sam Snead for the all-time PGA wins record and not far from Jack Nicklaus' 18 total majors. Tiger Woods cards have always enjoyed strong demand and values will begin to push higher if he can break the records that once seemed a foregone conclusion. If that happens with the typical Tiger flair, there is a chance for a boom reminiscent of his early-2000 values, when he was unstoppable on the course. 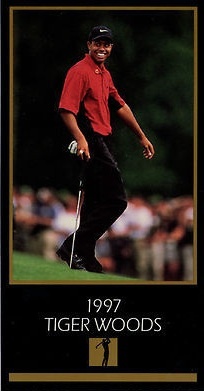 View Tiger Woods card acutions with the most bids on eBay. 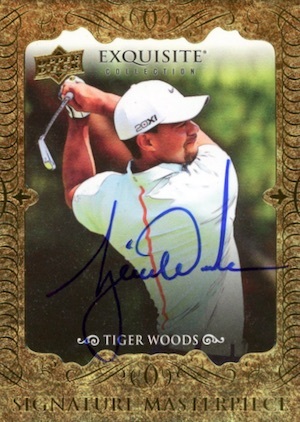 Despite there being quite a few Tiger Woods autographed cards on the market, they still maintain strong values based on generally low print runs and the very limited release of golf trading cards. Counting down some of the truly elite cardboard, the following list represents many of the best overall options for Tiger Woods. 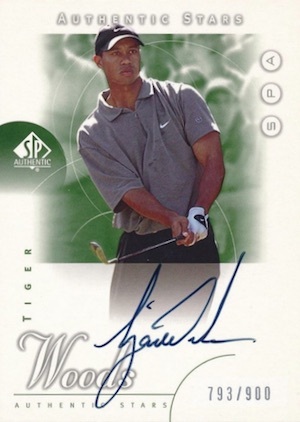 While any Tiger Woods certified autograph card would be a great addition to a collection, several have emerged as favorites. In addition, the few Tiger Woods rookie cards also hold a special place with many collectors. Shop singles on eBay and check current values using the links below. Although the design looks very dated and more like a print or poster than a normal trading card, the Grand Slam Ventures The Masters Collection release remains popular despite not coming from an established card brand. That is because the factory set is considered by many to be home to the first standard Tiger Woods rookie card. As such, it will always have interest and value. There is also a gold foil parallel which is more hotly pursued by collectors. The only "official" Tiger Woods base rookie despite coming years after his Grand Slam Ventures and Sports Illustrated cards, the 2001 UD release is a great value option. 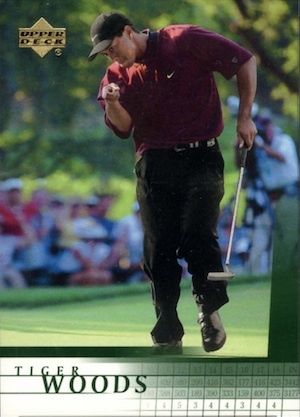 While there are several Tiger Woods cards in the 2001 Upper Deck Golf base set, card #1 is the one you want. Young, excited and passionate, this card typifies all the positive attributes of Tiger that made him a star. When you think about it, it is pretty ridiculous how valuable these cards became. They were originally found in perforated sheets located inside the December 1996 Sports Illustrated for Kids magazines. Tiger Woods shares the page with eight other athletes, including Martina Hingis, Doug Flutie, Jerry Stackhouse and Lisa Leslie. Given they are intended for children, it comes as no surprise that the design is clearly very basic. 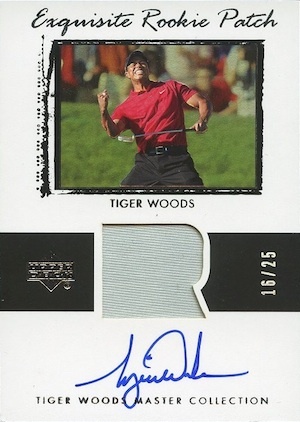 Although there are many reasons why it should be nothing more than a novelty, this true Tiger Woods rookie card is a great example of what makes collecting special. Even when it goes against all conventional wisdom, collectors inevitably decide which cards are valuable. 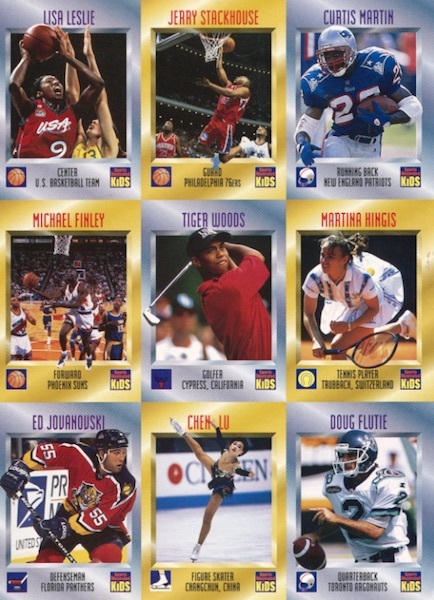 And the 1996 SI for Kids Tiger Woods card is clearly valuable, with high-grades selling into the thousands. 2012 SP Game Used made big waves with the Inked Drivers Autograph set. The unique idea applied a metal slab that was designed to look like the face of a driver head. This metal surface became the canvas for the autographs. 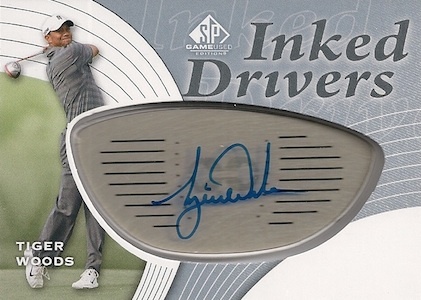 Also interesting, while Tiger Woods is normally among the toughest odds for autographs, SP Game Used has Tiger Woods in Group E, which features the most common autographs at 1:5 packs. There are also a few rare parallels, including Black (#/25) and Red & White (#/5). 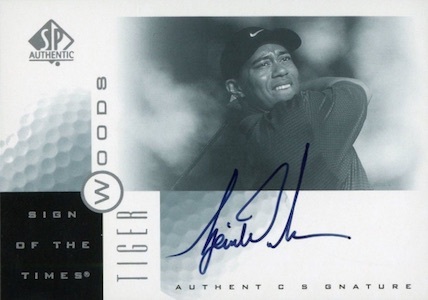 2001 SP Authentic's Sign of the Times insert is a notable release that features multiple Tiger Woods autographs. In addition to the primary SOTT card, which is not numbered, Tiger is part of a special Red set that has seven different cards. The print runs here range from 274 copies down to just four. Six cards in the set showcase a high-profile win, and one card honors the "Tiger Slam." 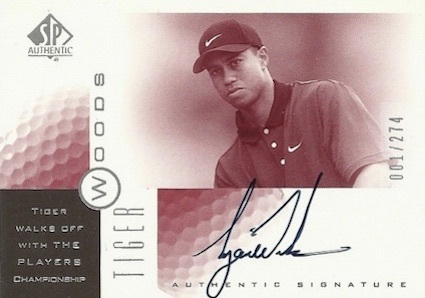 The 2013 Goodwin Sports Royalty autograph for Tiger receives considerable interest based on its rarity and appealing design. Clearly borrowing from 1933 Sport Kings, this hard-signed option for Tiger Woods is included in Group A, with odds of 1:7,473 packs. Group A also features Michael Jordan, Nolan Ryan, LeBron James and Jerry Rice. In fact, Woods has signed for many of the Goodwin sets over the years, so there are quite a few choices done with the more artistic look. 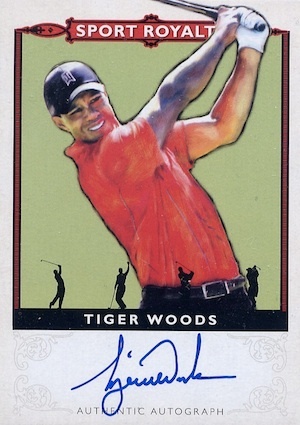 Another autograph from his inaugural Upper Deck set, the Player's Ink Tiger Woods features a horizontal layout with a green-and-white color scheme. Additionally, the card design incorporates a scorecard, further evoking the golf mindset. There is also a low-numbered gold parallel (#/25), if you need more of a challenge. On the surface, this might seem bizarre because golf and basketball have nothing in common. However, Tiger Woods and Michael Jordan make for one formidable pairing. Combining Jordan's well-known love of golf, with both Jordan and Woods' dominance at their respective sports, and it begins to make more sense. Add to that their shared Nike and Upper Deck background, and the two seem well-suited to share space on a card together. Pairing the signatures of two of the most influential and dominant athletes in modern sports, this is one amazing 2012 SP Authentic Golf card. The duo signed for several other sets over the years, as well, including 2014 Exquisite. 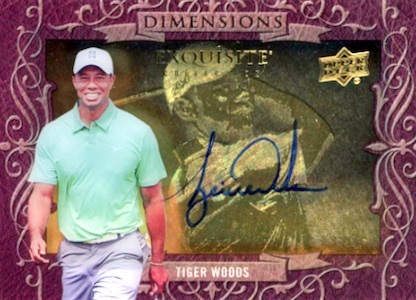 Speaking of Exquisite, the golfing debut for the premium set—UD's 2014 Exquisite Golf—naturally includes multiple Tiger Woods autographs. Noteworthy choices include the foil Signature Masterpiece, shadowbox Dimensions, and a few impressive multi-subject signature cards. Many products fall flat because they are merely the rehashing of the same basic formula. Upper Deck took the right combination of old and new, and hit a home run with 2013 Upper Deck Tiger Woods Master Collection. 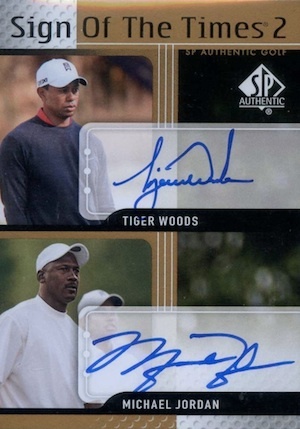 The product is absolutely loaded with low-numbered Tiger Woods autographs that sell for huge amounts. If you had to narrow it down, the Tiger Woods Exquisite Rookie Patch is the clear winner. Playing off the iconic 2003-04 Exquisite Basketball design, this is the biggest draw from a product filled with autographs from the golfing great. His Limited Logos auto patch is also pretty sweet. 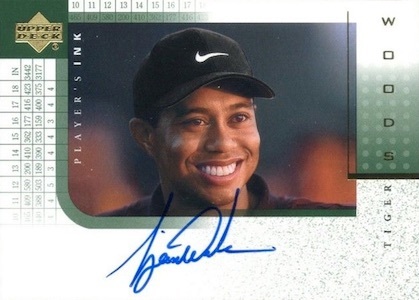 As the other official rookie card for Tiger Woods, a decent supply and very good values have made this 2001 SP Authentic card one of the top-selling Tiger Woods autographs out there. Even with a print run of 900 copies, prices remain strong. The simple and modern SPA Authentic Stars design utilizes an on-card autograph to make for one of the most popular Tiger Woods cards ever issued. A gold parallel (#/100) offers collectors even more rarity. 1996 sports illustrated for kids tiger woods. BGS 4.Must See! i have an autographed picture of Tiger woods at age 14 … It was acquired at the Feb 22,1992 Instant Quaker Oatmeal Today’s Sports Ground Breakers … What is the value of this photo? I have tiger woods spa 2001 rookie #/100 not graded but sealed in mint condition…anybody interested?? Anyone know the print run on the Jordan/Tiger Auto for 2012 SPA? I pulled on a few weeks ago. I have 26 packs of unopened 2001 Premium Edition. Upper Deck golf cards / packs of 5 . They have Tiger Woods picture on them and have no idea if I should sell them as is or open them and see what’s in store ! Have a 2010 World of sports card # 302 autographed. It is suppose to be the most rarest card. I want to sell it but have no idea what its worth. Beckett doesnt even list the card. Can you please point me in the right direction. I have the 1997 uncut masters gsv sheet that ends with Tiger. From what I read these sheets were not intended to be posters and are rare because people were hand cutting the Tiger card to get a better rating. I have seen later sheets for sale that end with 99 champ for $450 (5 years ago). Would this be considered a rookie card? It’s absolutely disgusting what certain companies do to produce low number productions of cards to demand ridiculous amounts of $’s for them. The autographed priced ones have gotten totally out of hand, and I can see that you support this kind of conduct by recognizing these cards. 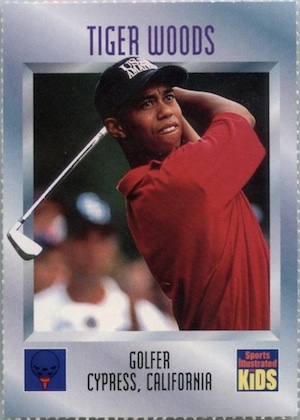 Why should a 2001 or even later card of Tiger Woods be worth more than a true rookie card from 1996 or 1997, just because a certain company only makes a few of them? It’s really sick. Mike Cohen � There is something out there for each collector and the whole point of this top list is to highlight multiple options that can apply to many different budgets and preferences. While you might prefer the earliest TW cards, plenty of collectors seek out Woods’ autographs and the cards generally viewed as his official rookies. I maintained a subscription to SI for Kids back then and got my copy of that card sent right to my door. Glad to have it. I’ve never been a huge golf fan but you can’t build a collection of iconic 1990s sports figures without him. I am honour to had pulled out of Exquisite Golf a TRIPLE AUTO OF WOODS/MCILROY/JORDAN out of /10, that would be my best TIGER WOODS CARD. CONGRATS TO TIGER WOODS FOR WINNING THE MASTER.